“Boundaries” (2018). Cast: Vera Farmiga, Christopher Plummer, Lewis MacDougall, Christopher Lloyd, Kirsten Schaal, Bobby Cannavale, Peter Fonda, Yahya Abdul-Mateen II, Dolly Wells, Chelah Horsdal, Ryan Robbins, Jill Teed, Sean Tyson, Halldor Bjarnason, Emily Holmes. Director: Shana Feste. Screenplay: Shana Feste. Web site. Trailer. 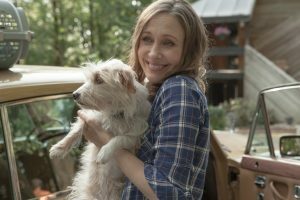 Laura Jaconi (Vera Farmiga) desperately needs to set some boundaries in her life. The single mother from Seattle seems compelled to take on all of the world’s hard luck cases. For starters, she’s a serial rescuer of stray dogs and cats, adopting so many animals that her house has become a virtual kennel. Then there’s Laura’s teenage son, Henry (Lewis MacDougall), a bright, talented illustrator whose outspoken attitude (and even more brazenly provocative drawings) frequently land him in trouble with everyone from his mother’s would-be romantic interest (Ryan Robbins) to the school principal (Jill Teed). Even Laura’s job offers no relief; in her role as an executive assistant to a wealthy, needy, demanding socialite (Dolly Wells), she’s often put upon to perform miracles to fulfill her boss’s whims. 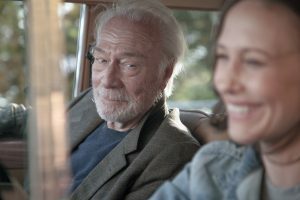 However, as onerous as these circumstances are, Laura’s biggest challenge comes from her 85-year-old father, Jack (Christopher Plummer). Daughter and dad have a long history of issues that stretch all the way back to Laura’s childhood. As a shady, unreliable, often-absent parent, Jack spent more time working on an assortment of dubious business and gambling schemes than he did as an engaged father raising Laura and her sister, JoJo (Kirsten Schaal), frequently leaving the girls on their own. These circumstances thus forced Laura into becoming “the responsible one” at an early age, a quality that quite obviously carried over into her adult life. Unfortunately, given the lack of attention that she so desperately craved from her old man, these conditions also created a mindset that she could never do enough – for anyone – in her quest to receive the approval and acknowledgment she sought. It’s no wonder that all of this has landed Laura in therapy. And even there she doesn’t let up, incessantly continuing her people pleasing ways with her counselor (Chelah Horsdal). Laura’s therapist tries to convince her that she’s basically doing well; all she really needs to do is set some healthy limits for herself, a message that Laura hears but that she doesn’t let sink in, because she fundamentally believes that she could (or should) be doing more, no matter what the circumstances. That’s a belief in which she’s about to get some truly powerful life lessons. Even though Laura has been intentionally trying to implement some boundaries between herself and her long-absent dad, it’s become difficult, ironically enough, given his now-persistent cell phone calls. She tries ignoring the endless incoming messages, but conditions at home finally force her hand into making contact with Jack: When Henry gets expelled from his school for drawing yet another of his lascivious illustrations, it’s apparent he needs to attend an institution for those who have special needs and gifts, an expensive proposition to be sure. Which is where Jack comes in. Despite the questionable nature of his business dealings over the years, Laura is under the impression that the old man is at least fairly well off financially and that he’s someone she can call on to help her out. Unfortunately, that proves to be a false assumption, particularly when Laura learns that Jack is being kicked out of his nursing home and has nowhere else to go. 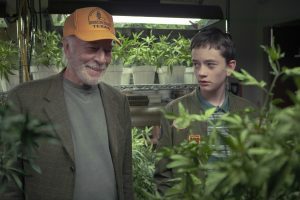 Jack asks to move in with Laura and Henry, but she won’t have it, believing that he would be a bad influence on her son. To counter that proposal, she makes arrangements to have Jack move in with JoJo in her Los Angeles apartment. Jack agrees but on one condition – that Laura drive him from Seattle to LA, an idea she resists – that is, until she learns that Jack will give her the money for Henry’s school if she complies. Laura finds Jack’s proposal tempting but wonders what’s behind the road trip. In part, he contends that, because of his failing health, he wants to spend some time with her and Henry while he has the chance. But it’s also at this point when the reason for Jack’s expulsion from his nursing home and the source of proposed funding for his grandson’s schooling become apparent: In yet another questionable business deal, Jack has become a purveyor of high-end pot, with clients lined up all along the West Coast – conveniently enough from Seattle to Los Angeles. If he can make delivery of his wares via a road trip, he’ll collect the money and give it to Laura for Henry’s tuition. Knowing that Laura won’t go for the idea, Jack tells her no details about his plan; he simply says he needs to make some stops along the way from Washington to California. He does tell Henry, however, recruiting him as a sort of apprentice, an idea the young man finds way cool. The teen thus becomes a de facto accomplice, as well as a guardian of grandpa’s back at times when the plan is in danger of being revealed. And so it’s under these circumstances that the unlikely trio and an assortment of rescue pets set off on their journey. It’s one in which they’ll have a variety of adventures and many conversations about a past that desperately requires closure. They’ll also encounter an array of colorful characters, including some of Jack’s old friends (Christopher Lloyd, Halldor Bjarnason, Peter Fonda) and Laura’s ex-husband, Leonard (Bobby Cannavale), the man who walked out on her and Henry three years earlier. Will the travelers find the answers they’re looking for? Will the wounds of the past heal? And will the boundaries in question be set to where they should be? That’s what the journey is all about. And, to paraphrase the Grateful Dead, what a long strange trip it is. As I’ve written on a number of previous occasions, road trip movies provide the perfect metaphor for the journeys of our lives, and the trek in “Boundaries” is no exception. To find the lessons and answers we seek, sometimes we need to get away from familiar circumstances to clear away the clutter and the camouflage that might obscure our view in more familiar, more comfortable environs. The journey provides a progression of new events, experiences and perspectives that shake us up (and, one would hope, out of our complacency) in finding fresh ideas, beliefs and manifestations. In essence, it encapsulates our experience as ever-evolving individuals, leaving behind who we were and enabling us to become who we believe we can be. In many ways, this is what lies at the heart of the conscious creation process, the means by which we materialize the reality we experience through the power of our thoughts, beliefs and intents. Such odysseys demonstrate how we’re all in a constant state of becoming, ever transforming from one milieu of existence into another through the conceptions of what we seek to manifest. And, as the scenario in this story shows, there’s a wide variety of probable experiences to be had, depending on what we conceive of and ultimately allow. There’s quite an irony in this case, though, given that the story deals with the question of boundaries, something that generally flies in the face of what conscious creation is all about. In most instances, conscious creation encourages us to break through the limitations that hold us back, to seek new adventures and experiences that are typically beyond what we associate with everyday life. However, in this story, the protagonist is in need to doing just the opposite – setting barriers that allow her to become a more effective conscious creation practitioner. Why is this so? Laura obviously has no trouble giving of herself and seeing the need to step in and offer help when it’s required by those who are less fortunate or who require guidance. In those circumstances, though, it’s possible to adopt manifesting beliefs that allow us to spread ourselves too thin. This, in turn, can dilute our materialization efforts, and, in the process, we may unwittingly put our own needs on the back burner while in service to others. There’s certainly nothing wrong with wanting to be of assistance, but, when we employ beliefs that cause us to carry the idea to an extreme, we can readily shortchange ourselves. This not only keeps us from attending to our own requirements, but it can also ultimately hamper what we do for others by causing us to operate from a position of personal weakness instead of personal strength. That can leave us depleted, ineffective and of little use, both to ourselves and our beneficiaries. This is where the benefits of boundaries come into play. One might assume that their establishment would be something seemingly easy to accomplish, yet many of us have trouble with this. Many of us keep giving and giving (often “until it hurts,” as many charities and religious institutions have encouraged over the years), never learning when to draw the line. For some of us, then, learning how to establish necessary, delineated limits may ultimately prove to be just as challenging as learning how to break down barriers. And, because of that, we may need to intentionally manifest circumstances where we give ourselves the opportunities to attain those very lessons, difficult or challenging though that may be. In creating such scenarios, we may end up attracting to ourselves conditions that seem patently unfair. In Laura’s case, for example, she’s saddled herself with being the daughter of an unreliable father, the single mother of an unruly teen, the ex-wife of a self-absorbed former husband and the employee of a demanding boss. And, if that weren’t enough, she perpetually seeks to take on even more with all of the rescue pets she so unreservedly shelters. Given these circumstances, anyone with a healthy sense of boundaries would likely and rightfully ask, when will enough be enough? How much more is she going to take on? Can’t she see what she’s doing to herself (and possibly those around her)? While conscious creation has an inherent sense of responsibility associated with what we manifest, that naturally includes our responsibility to ourselves. Yet many of us have somehow lost sight of that, willingly if unwittingly allowing ourselves to forego our own needs in favor of what we do for others. This is not to suggest that we should become selfish or uncaring when it comes to those around us, but it’s also not an open invitation to treat ourselves as doormats in the fulfillment of our own needs. Again, this is where boundaries come into play. But, if we’re to put them in place and are unsure how to do so, we must create for ourselves the circumstances where we come to see the need for their establishment. For those of us who are unpracticed at this or who fundamentally resist the idea of their implementation, we must often manifest situations that are so over the top that we can no longer tolerate what we’re experiencing. And this is how some of those seemingly unfair conditions may show up in our lives – they’re all part of our learning process, showing us what we are and are not willing to put up with. For example, would Laura grasp this idea if she didn’t have such an irresponsible father, self-serving ex-husband or capricious boss in her life? It’s under circumstances like this when the barriers eventually start to go up to create the kinds of healthy boundaries we were meant to have. In fact, if these teachers had all been more conciliatory toward Laura, she may have missed out on the lesson of learning how to establish boundaries in her life, potentially drawing out her learning curve or preventing her from acquiring this skill at all. Situations like this show us that there are reasons behind why things unfold as they do, even they don’t seemingly make sense at a surface level. The key is recognizing the underlying beliefs and what they were intended to achieve. This is where the “conscious” in conscious creation makes its presence felt. The more we recognition the nature and purpose of our beliefs, the more readily we’ll see how and why our existence materializes as it does – boundaries and all. This pleasant, frequently amusing road trip/family comedy-drama deals in the realities of establishing healthy limits in a way that few movies are willing to take on as forthrightly as this one does. It does a fine job of examining knowing when to set limits, when to break rules and when to let go of expectations that are never going to be fulfilled. 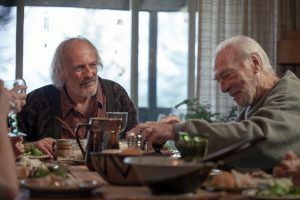 The picture’s excellent ensemble cast of both human and animal actors lends considerable credibility to the narrative, making for an enjoyable viewing experience. 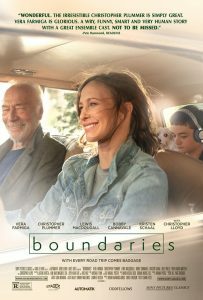 Admittedly, there is some occasional over-the-top wackiness that seems out of place, but “Boundaries” overall offers up a story that effectively weaves warmth, fun and heartfelt emotion into a pleasing, satisfying package. In his legendary work “Mending Wall,” poet Robert Frost wrote “Good fences make good neighbours,” a sentiment apropos to this film. While Frost may not have been speaking about the kinds of boundaries addressed in this picture per se, he might as well have been, because his advice is just as sound, as many of us often find (and that Laura is beginning to discover for herself). May we always be able to locate the necessary metaphysical bricks and mortar when we need them – especially when the neighbours start to become a little too intrusive. Copyright © 2018, by Brent Marchant. All rights reserved.